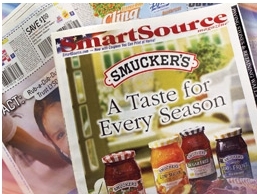 Smartsource Coupons Now In The Wall Street Journal! All I can say is wow, what does that tell you? If you ever wondered who really uses coupons, besides the readers that pop onto this site everyday, this may answer your question. Starting today, The Wall Street Journal, in their Weekend edition, will now have the Smartsource inserts included in their newspaper in select market. The Journal has a median household income of $128,453 so the addition of inserts that carry things like $0.50 coupons for Kraft Mac & Cheese fits right in with the interesting stats I had posted up in March titled We Really Are Living Rich With Coupons. So if you can now get coupons from the Wall Street Journal, I don’t feel as bad whipping out a stack of coupons out of my Prada bag in ShopRite. Don’t worry, I didn’t pay full price for that bag. As a matter of fact, I didn’t pay for it at all, it was a gift. But it still doesn’t lessen the irony. You can head over here to read more on the new addition to the Journal.